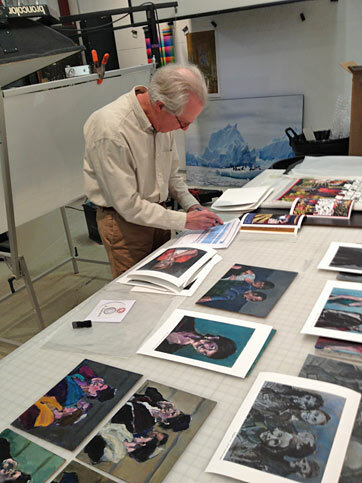 We print on a variety of archival substrates, including Breathing Color, Hahnemuhle and other fine art papers. Custom profiling on additional custom papers is available too. As well we offer prints on canvas, aluminum, translucent and transparent film (for transfer prints and light boxes), a wide variety of fabrics on our 44" and 60" printers and on any flat surface (wood, glass, plastic, rubber, etc.) 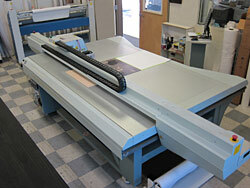 up to 48x96" and 3/4" thick on the Arizona Flatbed printer. 6x9" proofs on stocked papers and canvases are $15 each. Prints are priced by the square inch. Sample first print prices on our standard papers and canvases are listed in the chart below. For additional pricing and discounts for multiple prints use the calculator below. Translucent and transparent prints are $.09 per square inch. Flatbed prints are $16 per square foot. Call for fabric and premium paper pricing. Available in any size from 4x6" to 48x72". Four finishes: white gloss, white matte, silver gloss, silver matte. $16.00 per square foot on any artist-supplied surface up to 48" x 98" x 1.75".